The double guitar version of our new Hang-It!™Guitar Stands is height adjustable. It is designed to hang most guitars and basses by their headstock. The tripod base provides stability and folds closed for guitarists on the go. Features velveteen rubber on all contact surfaces. 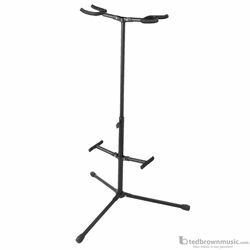 Designed to hang most standard guitars by their headstocks, Height adjustable upper shaft makes this stand universal to fit different guitar models& sizes. Has non-slip rubber end caps.